The Technicolor COM1000 was a revolutionary HD headend system when it was introduced in 2009 and changed the way TV for hotels was provided in hotels with over 250 rooms. Over the past 4 years DIRECTV and Technicolor have made many improvements to make the COM1000 headend system even more more stable and cost effective. In June of 2014 DIRECTV and Technicolor announced the New COM2000 system. The COM2000 brings along with it the nearly plug and play platform and stability of the COM1000 with some outstanding new features. Plus many more new features and benefits that make HD TV conversion easy and more cost effective than ever before. Before the DIRECTV Com1000, upgrading to HD had been an expensive and disruptive conversion for large properties (over 250 rooms) and hotels that do not have home run wiring. The Technicolor Com1000 HD Headend gives you an affordable option to rewiring your property. The Technicolor COM1000 Pro:idiom HD Headend System provides you with the very best option in Hotel Television Systems for properties that do not currently have or are unable to install “home run” wiring. 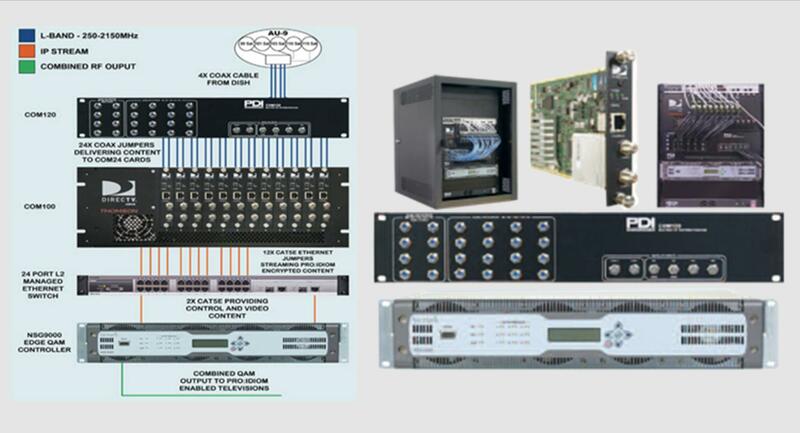 The COM1000 Headend is designed to lower the per channel costs of delivering HD television programming, decrease the space needed, and add more HD channel capability to Hotels, Resorts, Assisted Living and Senior Care Facilities, Hospitals, Dormitories and other temporary dwelling properties. The COM1000 Headend system provides DIRECTV Hotel Television Systems a stable QAM modulated RF platform to make HD more affordable for hotel owners today, and more expandable for tomorrow. The DIRECTV COM1000, developed in partnership with Technicolor, is a leap forward in technology platforms to deliver DIRECTV’s HD programming to Multi-Client properties like hotels, resorts & assisted living facilities. The Pro:Idiom transcoder is a modified DIRECTV receiver that converts high-definition DIRECTV signal into to a digital format that can be delivered through the hotel TV distribution network. LG’s Pro:Idiom technology is a digital video content security system (DRM) designed to encrypt the signal so that only authorized Pro:Idiom HDTVs or televisions with a decryption box (set top or internal) can decode the signal and display the video on its screen. The Pro:Idiom transcoder is built into the head end, one transcoder per channel. Pro:Idiom enabled HDTVs have the ability to decode the encrypted signal sent from the Pro:Idiom Transcoder so that the content can be seen by your customers Identification Module (IDM). Pro:Idiom HDTVs also have an insertion point for the ID Module, which marks each individual room’s video signal with a unique and traceable key code for additional content security. Broadcast stations such as ESPN HD, HBO HD and SHOWTIME HD require this component in order to protect their content from piracy. 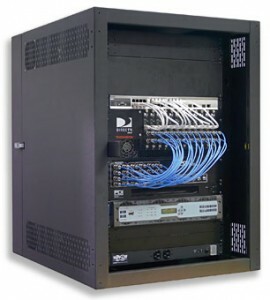 Does Your Hotel Need a Com1000 Headend? For newer hotels and older properties with newer wiring, often the best option for providing HD TV is the DIRECTV Residential Experience for Hotels. Its provides a more robust channel availability, a TV viewing experience more like the one your hotel guests are used to at home, and added functionality for the hotel property. The very best way to determine if your hotel needs a Com1000 headend system to deliver HD programming to your guests is to have an experience, certified technician do a site survey of your property. If your property meets all the above requirements and you have fewer than 1000 rooms, you may be a good candidate for the DIRECTV Residential Experience. If those are not available in your property they will determine whether it is cost effective to upgrade your cabling or if a DIRECTV Com1000 Headend system from Technicolor would be your best option.